Regular readers of this blog might notice that I’ve been absent for a week or so. There are a few reasons for this. Firstly, I’ve been spending a lot of time reading for my Goodreads Challenge (more on that in another post) secondly, I wrote a guest post about great Christmas gifts for gardeners for the utterly marvellous The Culture Vulture and lastly because the run up to Christmas is a bit crazy, and I’ve been struggling to find the time. And, if I’m honest, the motivation. If you’re anything like me, you’ll still have gifts to choose and not much time to get them organised. So, in my only contribution to the whole Christmas shopping conversation, I present to you my last minute gift solution for that difficult-to-buy-for person in your life: A subscription to Stack. I’ve spoken before about my magazine buying addiction – and how it’s a constant battle, but one that I’m gradually winning – but the one subscription I’m not giving up is my subscription to Stack. Earlier this year, I was fortunate enough to go to a Guardian Masterclass on Reinventing Magazines, during which the founder of Stack spoke with lots of passion about the future of the printed word. When I got home from the event, I subscribed immediately. It’s a unique service, posting out a different independently produced magazine each month. You don’t know what you’re going to be sent, so each month is like a little surprise. The one thing that links them all is that they’re beautifully created. I’ve had a variety of titles, on subjects including film, food, cycling and urban art. All of them have had something to interest me, and in some cases, I’ve fallen completely in love with them. This month I received Delayed Gratification, a magazine dedicated to ‘Slow Journalism’ and it’s wonderful. 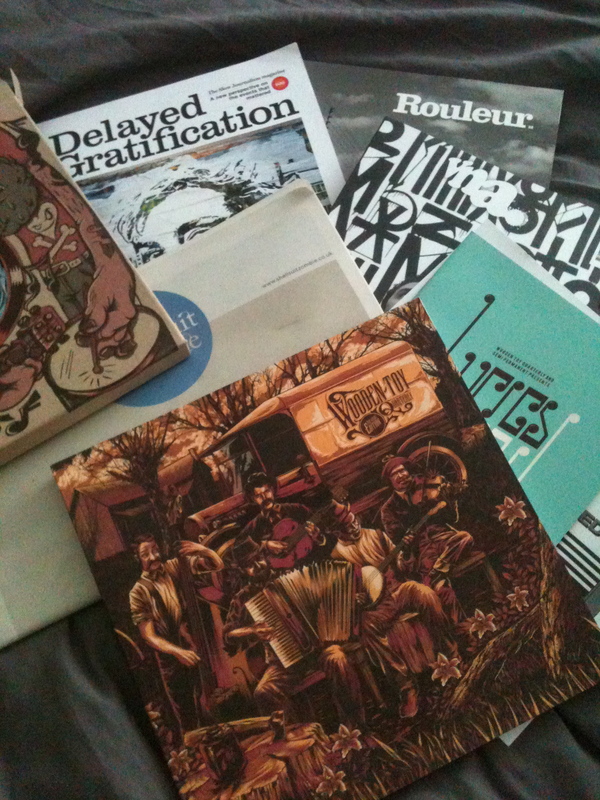 Some other titles they send out include Little White Lies, Fire & Knives, Rouleur, Wooden-Toy Quarterly and Oh Comely. All of which are gorgeous, intelligent and worth savouring. Not like many other glossy magazines that are basically stuffed full of adverts and articles that promise to help us ‘Get the Perfect Life/Body/Wardrobe in Ten Easy Steps’… Or, in other words, a lot of wasted paper and ink. 4 Responses to My Sole Christmas Gift Idea: Stack Magazines. If the shops in Leeds wait until after Hallowe’en before putting Christmas stuff out, you’re lucky! I generally see the first Christmas things in the shops before my birthday! Personally, I think September is a tad early for something which has a built in timer that starts on the first of December…. (I know, a Pagan screaming “Don’t you know what ‘Advent’ is!” is a little ironic!) but to me it spoils the special-ness of Christmas when its being sold for a quarter of the year! I completely agree that Christmas comes far too early. I am a mum of 2 and I absolutely love Christmas, more so now that I have children of my own. When I was a child Christmas was traditionally 12 days before and a little after which made it special. Now it has almost merged back to back with Halloween! I run a Children’s boutique and in my opinion it’s the larger corporations that force the market before time. Unfortunately if smaller shops like ours dont comply we cant make a living. We are now seeing winter sales start before Christmas eve. Its very sad indeed. Thanks for taking the time to read my ramblings and please please support your local high street shops and the humble boutique! Lets not loose Christmas completely to corporate greed and folly.